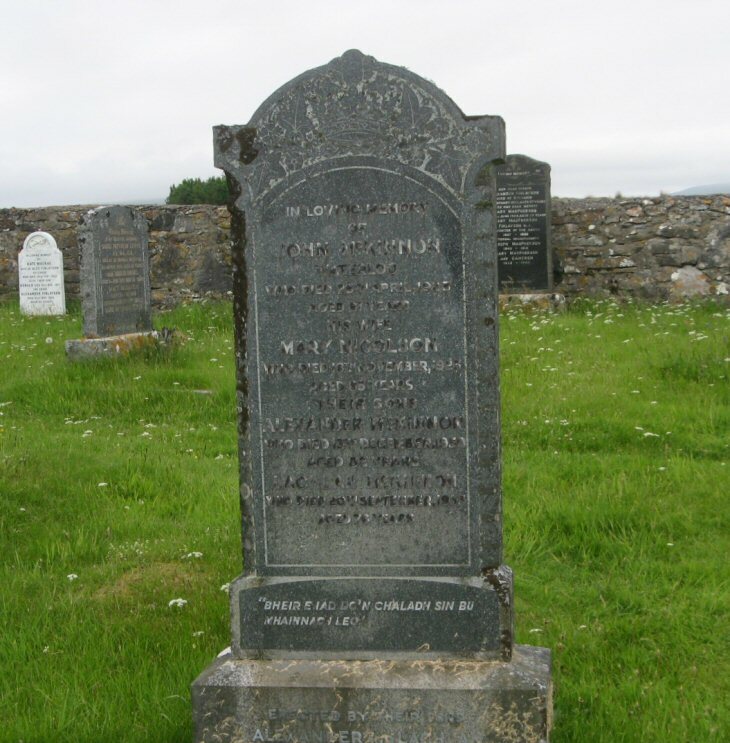 Skye Gravestones | John & Mary (Nicolson) McKinnon, Alex. & Lachlan. John & Mary (Nicolson) McKinnon, Alex. & Lachlan. In loving memory/of/JOHN McKINNON, Waterloo/who died 25th April 1923/aged 81 years/his wife/MARY NICOLSON/who died 18th November 1923/aged 85 years teir sons/ALEXANDER McKINNON/who died 13th ecember 1950/aged 82 years/LACHLAN McKINNON/who died 20th September 1953/aged 76 years. "Bheir e iad d'n chaladh sin bu/mhainnach leo."